Since you don’t want to end up a pancake, you have to make sure you’re easy to spot from a distance. 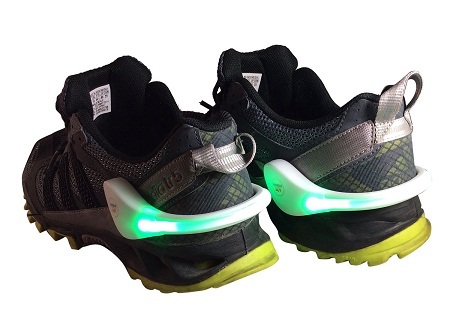 These Rumble Shoe Lights use LEDs so that runners, bikers, pets, and your little ones will be seen before it’s too late. You can put these on the backs of your tennis shoes, on top of your feet, around your wrist, or forearm. Despite the tension setting, you can imagine fun runners who go 8MPH or more probably won’t be able to keep these on very well. There are three settings for visibility which include a constant glow, pulse, and a self-starting sensor mode. You should get around 100 hours of use out of each CR2032 battery, and these should hold up in any weather situation. You’ll be looking at paying out around $9.99 whether you get the black set with orange lights or the white set with green lights. Either way, you’re going to be seen at least a little bit better at night.